"It's all about the money. Or the lack of it." 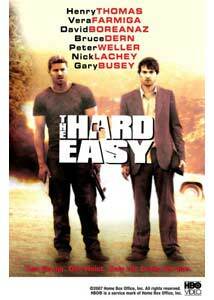 The Hard Easy is a first-time project for the director (Ari Ryan), as well as the writers (Jon Lindstrom, Tom Schanley), and as an entry in the quirky heist/caper flick that could mean some potential trouble. I've seen a lot of sloppy attempts by more seasoned teams, and it's just a tough genre to get exactly right. When done well (see Tarantino or Ritchie) the dialogue is snappy, the violence has to be explosive and the characters need to be colorful. Come up short on any of these three elements and the uneven balance will make the whole thing list horribly. Ryan, Lindstrom and Schanley don't hit all the marks exactly right here, but enough of it works when it needs to give this a watchable B-movie feel. The premise here is revealed during the opening robbery sequence, where two separate groups of criminals end up robbing the same jewelry store at the same time. With expletives flying and weapons pointed toward one another, the story then jumps backward to show how this came to be, with a pair of subplots following down-on-his-luck-gambler-who-owes-a-fortune-to-the-mob Paul (Henry Thomas) and soon-to-be-sent-to-prison-because-of-bogus-bond-trading-stockbroker Roger (David Boreanz). Both Paul and Roger need a large sum of money very quickly, and each get reluctantly drawn into separate plans to steal the same shipment of diamonds, valued at a whopping $15 million. A big selling point is the familiar face cast Ryan has assembled, led by E.T. 's Thomas and Angel David Boreanz. Both are likeable schlubs drawn into crime by their own self-made bad decisions, and though we know what they're doing is wrong it is initially difficult to want anything particularly bad to happen to them. But what helps boot this into the quirky realm is a trio of comically bizarre performances by Peter Weller, Gary Busey and Bruce Dern, each of whom get to chew things up with campy, macho abandon; Weller hands down gets the funniest lines throughout as the cigar-smoking ex-commando who uses the word "gonad" more in one film than I thought was possible. The Departed's Vera Farmiga gets one of the more enjoyably diverse roles in The Hard Easy, and she manages to convey a slick mix of casual sexiness and gun-toting rage, which gives her character enough edge to stand up against the testosterone strut of Weller, Busey and Dern. The screenplay waffles back-and-forth between the two storylines until things ultimately converge as we already know they're going to (at least to a point), and that's when the gunfire gets heavy and Ryan attempts to pay things off with violent excess. Though it may not feel like it early on�when I was beginning to suspect this film would not walk the walk it was promising�there is a great amount of shooting and swearing, and naturally a couple of exploding cars. Sprinkled along the way there's a couple of secondary storylines about the estranged/divorced spouses of Roger and Paul�which is what ultimately fuels their involvement in the robbery�and a fun sequence featuring Rae Allen as a grandmotherly mobster with a penchant for using pliers to make her point to those who owe her money. File this one under either the rental or catch-it-on-cable categories, for when you're willing to wallow in a B-grade heist made endurable by a handful of nicely over-tweaked performances that seem well aware of their own two-fisted silliness. Image Transfer Review: The 1.78:1 anamorphic widescreen transfer has plenty of nice, bright colors during daylight sequences but comes up a little short with dramatically weaker black levels that render a couple of the nighttime exteriors somewhat muddy. Rather soft edge details overall is another minor beef�though not a massive distraction. The print is blemish-free, and is devoid of any nicks, scratches or dirt. Audio Transfer Review: No major complaints with the modestly active Dolby Digital 5.1 surround, and while it isn't overly aggressive, it does utilize the rear channels often for elements such as gunfire and helicopters. Directional movement across the front channels also helps sell some of the bigger action moments, with voice quality sounding clean at all times. The aforementioned gunfire has a deep kick to it, and there's also a few very low transitional stingers that deliver a nice sub rumble, too. Extras Review: Director Ari Ryan and producer Scott Gold serve up a commentary for the film, but the content is not terribly electric. The usual topics�locations, first day of shooting, "here's an interesting story about this scene"�get covered, but there just isn't anything essential about this track. More bite-sized is Interview With Director Ari Ryan (07m:22s), a rather quick set of comments that quickly outline the concept and what Ryan consider's the film's "theatrical" storyline. He talks of having to hard sell to get more funds to add the explosions and gunfire as proper payback to the audience, and you have to kind of like a guy that at least acknowledges that. The disc is cut into 12 chapters, with optional subtitles in English or Spanish. The quirky heist/caper flick is a tough one to nail down properly, and The Hard Easy does a lot of things right, but is missing a certain something. A strong ensemble cast of familiar faces is a large part of the appeal here, and though violence is only implied during much of the first two-thirds of the film, director Ari Ryan does indeed uncork with some nicely over-the-top gunplay and explosions to help sell a low-budget Tarantino/Ritchie vibe. Far from flawless, but worth a rental.